These cute foal stud earrings would make a wonderful gift for the junior equestrian. 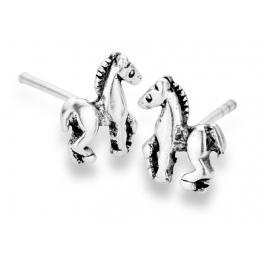 Well designed and beautifully crafted in sterling silver, they are a must have for any horse lover to add to their collection of equestrian jewellery (jewelry). Measuring 10mm high, they come presented in our black leatherette presentation box.